Last night I tried my hand at capturing audio from the 2010 Leonid Metoer shower. I was listening in and recording the stream from Space Weather Radio. 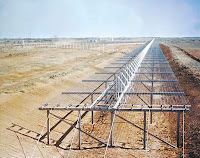 This is possible because of the US Air Force Space Surveillance Radar (pictured left). There's a lot of junk in space and when the government is flying multimillion dollar craft up there they want to keep them safe. 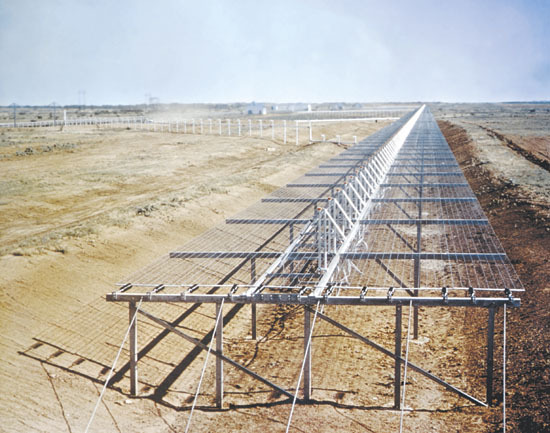 The space radar's primary antenna is located in Kickapoo Texas. Twenty-four hours a day it puts out 800 kilowatts of continuous wave power at 216.98 Mhz. It sounds like a steady tone. The primary mission is to monitor everything in orbit. It can detect objects as small as 10 centimeters orbiting at up to 30,000 km above earth. The radar works by having the signal bounce off objects and reflect the signal back to a number of listening stations. During a meteor shower, meteors streak through the atmosphere and create a trail of ionized dust. The radio signal reflects off this trail and we can hear the signal change. Space Weather Radio has a listening station set up by Stan Nelson on the roof of his house a couple hundred miles away in Roswell, NM. Space Weather Radio streams the signal over the web and you can listen in. During a meteor shower, you can recognize meteors by the sound. Depending on a number of factors you can hear different things. I listened last night for about an hour while I read a book and recorded as I went. I captured about 20 "event" sounds and heard probably 10 more that were too faint to bother capturing. Only a few of them were meteors. Here's some of the more interesting audio I captured last night. A lot of what I heard last night was little chirps and slow whistles. From what I understand, these are not meteors but rather the signal bouncing off satellites. Most meteors do not exhibit a doppler effect, they simply start with a kind of ping and then fade out. However, I understand that they can have doppler shift if they are traveling perpendicular to the broadcasting signal. Perhaps someone reading can give me feedback on this. Here are some of the more interesting sounds I recorded last night. Everything is open to interpretation. Feel free to correct me in the comments. Description: This clip starts with the 216.98 Mhz background signal barely audible. Three seconds in, there is an initial quiet descending whistle followed by a second whistle at 7 seconds in. The second whistle is at a higher frequency. I'm pretty sure these are not meteors. They have a clear descending tone caused by doppler shift. I believe they are a pair of satellites and not meteors. Description: This one starts with the background signal much louder. There is then a very quick descending tone. It is almost more of a strong chirp than a whistle. I'm guessing this is a satellite as well but this one moving a lot faster. Description: This was the strongest meteor I picked up during the session. You can hear it sounds different than the previous two. It is a strong Ping that slowly fades. Description: I'm guessing this too is a satellite reflection and not a meteor. Description: Last one of the evening. This is just a classic small meteor. All in all it was pretty interesting to listen in. I heard more "other" sounds than meteors but then again I wasn't listening during either of the "peaks" of the shower. Please leave comments and let me know what you think. UPDATE: Hear more sounds in PART TWO of this post.